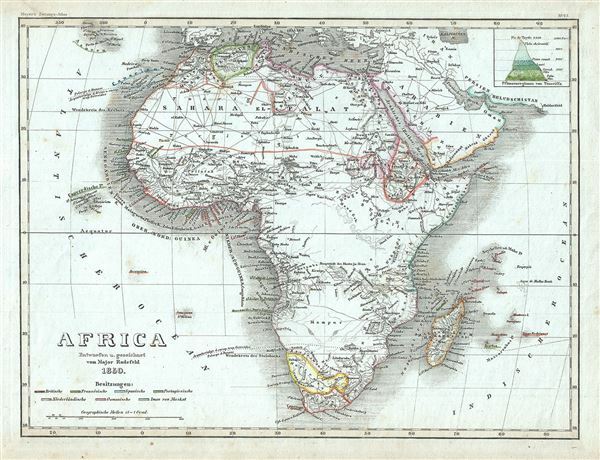 This is a fine map of Africa by Joseph Meyer dating to 1850. It covers the entire continent from the Mediterranean Sea to Cape Town, including Madagascar on the cusp of the great exploratory expeditions of the mid-19th century undertaken by Speke, Livingstone, and Stanley. Though European colonies and outposts dot the coastlines, much of the interior remains unknown, even speculative. Lake Malawi, near Mozambique, appears in embryonic form, no doubt drawn from indigenous and missionary reports, but gives some hint of the Great Rift Valley lakes soon to be discovered. An inset in the upper right quadrant details the plants on Tenerife Island, the largest of the Canary Islands. This map was issued as plate no. 95 in Meyer's Zeitung Atlas. Although all the maps in this atlas are not individually dated, the title page and maps were often updated while the imprint with the date was not, causing confusion to the exact date for some of the maps. Moreover some maps in the atlas were taped in at a later date as an update to the atlas. We have dated the maps in this collection to the best of our ability.